It’s not every day you have the chance to attend a hedgehog appreciation evening, so when we saw an advert in the superb Penang Free Sheet calling all hedgehog owners and adorers to meet at The Lightbulb Cafe in George Town, we knew we had to go. Leaving our Uber and heading through the monsoon rain to the ultra-hip Lightbulb, we didn’t know what to expect. As we introduced ourselves to the group of young hedgehog enthusiasts, they seemed baffled as to our presence there. However, far from giving us a prickly welcome, they were eager to get us acquainted with their cute little erinaceinae (that’s Latin for hedgehog in case you were wondering). We ordered some shockingly overpriced lemon and ginger teas, and without further ado we were we haphazardly handling hedgehogs in the hipster haunt. We learned that these spiny creatures are a popular pet in Malaysia, as well as many other parts of Asia. The majority are a breed of African hedgehog which is much smaller than the wild UK variety that we’re familiar with. Entirely domesticated, they are fed cat food, but also meal worms as a treat, and would probably not survive in the wild. Although feeding a hedgehog cat food sounds a bit odd, all of them looked very healthy so it must do them good! Neither of us had ever handled a hedgehog before, and it was pretty strange at first. Their spines weren’t as prickly as expected, but felt plasticy, as if they were made for a toy hedgehog instead. Their clawed feet were reminiscent of those on the pet guinea pigs and hamsters from our formative years, and their bellies were soft, silky and satisfying to tickle. All the while the little hogs sniffed away at us with their prominent snouts. Being virtually blind, they rely heavily on smell to guide them through life, so they like to become familiar with your aroma. This complete lack of spatial awareness also means that if you let them walk on a table, you have to be very careful that they don’t just walk right off the edge. It’s a responsibility we weren’t expecting to have. Most of the hedgehog fanciers in attendance were breeders themselves, owning from 3 to 30 animals each. Breeding hedgehogs sounds like a lucrative operation. Some sought after breeds, such as the pasty albinos with bright red eyes, can sell for 600 RM each. When you consider that the median monthly income in Malaysia is only around 400 RM, they’re a potential goldmine. Whilst we’re still not sure if we’d ever own a hedgehog ourselves (they’ve got nothing on cats), it’s obvious that they make nifty little pets. With their fluffy bellies crying out for a tickle, and their almost strokable spikes, they score high on the cute factor. The owners’ adoration for the rodents was infectious, and there was definitely something soothing about spending time in their presence. Even though the price of the tea was extortionate, it was just about worth it for an evening with some delightfully friendly locals and the for their sniffling snugly hedgehogs. Kuala Lumpur was probably great once. It might be great again one day, but for now it’s just a network of building sites connected by a web of dirty, smelly alleyways. For some reason, we thought it was a good idea to spend 4 nights in KL. This was far too long. Luckily we had an awesome Couchsurfing host, so we didn’t pay for accommodation. If you find yourself in the city for a day, here’s a suggested tour to help you enjoy your 24 hours. Top tip: Download Uber before you arrive. We usually like to walk around cities, but it’s often impossible in KL. The public transport system is poorly planned and badly connected, so even if you get the LRT or Monorail as close as possible to where you want to go, you will usually find a 40ft concrete wall or a dual carriageway between you and your destination. 8:00 – Start at Old Town White Coffee for breakfast – This is where locals eat their breakfast if they fancy something other than chicken rice. They serve great coffee and offer a sumptuous selection of baked goods – a great way to start the day! Try some traditional Kaya toast or go for the French toast if you’re feeling continental . There are loads of these around the city, so it’s easy to find one near wherever you’re staying. Sure, it’s a chain, but trust us, it’s way better than Starbucks. 9:00 – LRT to Batu Caves – For once the LRT actually drops you off near your intended destination, although the Port Klang line that goes to Batu Caves only runs one train every 45 minutes at off-peak times. It’s best to go early in the day before it gets too hot because you have to climb 272 steps to get to the top. That, and you might be cajoled into a bit of manual labour along the way. Nick had to carry 2 heavy buckets of rocks all the way to the top and no one explained why. The 140ft tall gold Murugan statue that guards the caves is surely impressive when it isn’t surrounded by scaffolding, and the 400 million year old caves must be spectacular when they’re not covered in discarded building materials and rubbish. On the plus side, a lot of monkeys hang out in the caves, so that’s pretty cool. Just hold on to your sunglasses! 12:00 – Central Market for lunch – Get the LRT to Pasar Seni, take the exit where the open sewer flows into the river and walk to Central Market. There are some lovely souvenirs on offer here and a food court where you can grab some reasonably priced nasi goreng or Thai chicken. It’s not the best food court we’ve ever been to (KL’s got nothing on Singapore), but the food is fairly tasty, served quickly and you can get fresh fruit juices and cheapish bottles of Skol lager – inexplicably the lowest priced beer in most Malaysian restaurants. There’s also a 3D illusion art museum on the second floor, if you like that kind of thing. Top tip: If you go to the museum and then pretend to change your mind about visiting, they’ll give you a discount coupon. 14:00 – Menara KL / KL Tower – The viewing platform here is 100m higher than the Petronas Towers Sky Bridge and costs less. Get the free, but usually packed, GOKL bus from Pasar Seni to KL Tower, then get the free shuttle bus from the bottom of the hill on Jalan Punchak to the base of the tower. There are 2 different viewing platforms, but we recommend just paying for the first one because it’s half the price and almost as high as the second one. The view is pretty impressive too, despite what they tell you at the ticket counter! 16:30 – Amusement Square at Berjaya – Take the Monorail from Bukit Nanas to Bukit Bintang and walk to Berjaya Times Square. On the 6th floor you’ll find Amusement Square – probably the best arcade we’ve ever been to. Battle it out on Time Crisis 4, speed your way to victory on Mario Cart and try not to pee in your pants while playing Dark Escape 4D. We were lucky enough to visit on their 30th Anniversary, so we paid RM50 for both of us and had unlimited plays on all of the games. Nick thought he’d died and gone to heaven! Keep an eye out for special promotions like this on the Times Square website. 19:00 – Wong Ah Wah for dinner – Walk to Jalan Alor (otherwise known as food street) and at the far end you will find Wong Ah Wah. Famous for its BBQ chicken wings, it is a sprawling restaurant with tables and chairs all over the ‘road’. The servers carry walkie talkies and bark your order at the relevant hawker chef from your table – it’s a slick operation. We can recommend the satay and the sambal prawns! 21:00 – Grab a drink at the Heli Lounge Bar – you can walk here from Wong Ah Wah in about 15 minutes, or get an Uber for about RM3. We didn’t actually go there because they wouldn’t let us in with our cut-offs and flip-flops, but we’ve heard great things from fellow travellers. We did see it from KL Tower and thought it looked pretty cool, so if we ever have to go back to KL this will definitely be on our list. Heli pad by day, bar by night, the Heli Lounge Bar is on the roof of Menara KH and has no fence or safety rails to stop you from plummeting to your death. It’s probably best not to drink too much here, but drinking is generally frowned upon in KL anyway. 22:00 – View the Petronas Towers at night – get the monorail from Raja Chukan to Bukit Nanas, then change to the Kelana Jaya line and get the LRT to KLCC. You can exit the station right at the foot of the Petronas Towers, then walk around the KLCC Park to get a great view of them lit up. We think the twin towers look much more impressive from the outside than the inside, plus it’s free to look at them from the park. Our ‘24 hours’ ends here because, if like us, you didn’t want to pay for accommodation, it’s probably time to head back to your Couchsurfer host and pass out with exhaustion. 1. The food – We love great food. We love reasonably priced great food even more. We might go on about the food in Singapore, but once you get here you’ll understand why. There aren’t many places in the world where you can get a Bib Gourmand meal for less than the price of a big mac, but Singapore is full of talented hawker chefs who will cook up a flavoursome feast in a matter of seconds. In fact, according to the ArtScience Museum, there are so many hawker stalls in Singapore that it would take 160 years to try them all. How do you choose? We like to play a little game called ‘hawker roulette’. The game involves joining the longest queue (long queues mean good food) and waiting until you get to the front of the line to look at the menu. Hopefully live bull frog porridge isn’t the only option. 2. The coffee – Having been disappointed with the coffee scenes in a lot of other cities, we were overjoyed at the choice on offer in Singapore. 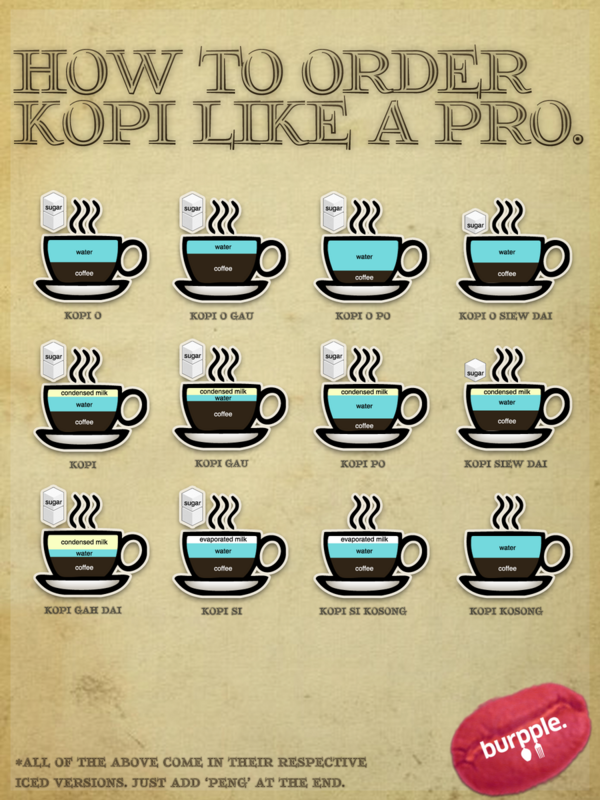 Rich, tar like kopi is brewed in large metal jugs and pored down an elongated spout into a hot glass mug. Delicious! 3. The shopping – Whether you’re on a budget or you like to splurge, Singapore has everything you could ever want. Head to Orchard Road to browse designer brands and big labels in air conditioned comfort. China town and Bugis offer more affordable, if not so genuine, merchandise. Nick’s watch died in a snorkelling accident in Fiji, so he bought a probably fake Casio on a Bugis street corner and to our surprise it’s still working! Bugis Junction shopping mall even has an air conditioned roof garden with a fishing pond. Don’t ask us why. 4. The architecture – Singapore seems to be one big juxtaposition, and the architecture is no exception. Original colonial mansions and colourful Malay fishing cottages clash with ultra modern skyscrapers clad in glass and chrome. The Marina Bay Sands Resort boasts a giant ship structure, balanced on top of three buildings. We thought it was hideous, but it seems to be a hit with everyone else. This ominous super structure looms over the ArtScience Museum which looks like a huge bunch of white bananas, but with some cracking exhibitions (usually with an entry fee), it’s well worth a visit..
5. The public transport – It’s efficient, clean, easy to use, never late, never too crowded and the trains show videos explaining how to be polite and courteous to each other. It’s everything the London Underground wishes it could be. Take note Sadiq Khan! 6. The art – Due to it’s strict no graffiti policy, there’s not much street art in Singapore. It’s no problem though, because the Singapore Art Museum always has excellent exhibitions, and on Friday night you can visit them for free! We were lucky enough to visit one of the exhibitions about Singapore’s independence and were given an unexpected private tour by a very proud and enthusiastic curator. 7. The education – Singapore is known to have one of the best education systems in the world, and the arts education here is particularly exceptional. We thought that the Arts University Bournemouth was good, but it’s nothing compared to Nanyang Technological University which has a sweeping, living roof, or LA SALLE College of the Arts which hosts high quality and sometimes controversial exhibitions for the public. 9. The Supertrees – Taken straight from the film Avatar, the Supertrees stand 25-50 meters tall and are covered in over 162,900 plants. These breathtaking living structures provide shade and a peaceful place to chill out during the day, and an exhilarating light show in the evenings. Best of all, entrance to the Gardens by the Bay is free! 10. The airport – Changi Airport is constantly awarded the prestigious title ‘World’s best Airport’, and we have to agree it is amazing. There is a koi pond, a rooftop swimming pool, a butterfly garden and a 24 hour free cinema. On the way to your departure gate, you can relax in one of the many free massage chairs. It’s almost worth the airfare just to go to the airport, then fly home again. 11. The Night Safari – A Zoo without cages? That’s right. Thanks to the clever use of trenches and wire, you can come face to face with elephants, lions, hyenas and rhinos when they are at their most active – at night. There are some animals that are behind glass, such as the tigers and leopards, for obvious reasons, but it’s still cool to see them prowling around at night rather than sleeping during the day. A must do in Singapore. We have no shame stealing this image from the Night Safari website, it was too dark for us to take photos! 12. The surreal experience of Haw Par Villa – Also known as Tiger Balm Gardens, Haw Par Villa is as close to a bad trip as you can get without actually taking hallucinogens. Check out the 10 Courts of Hell if you would like some new ideas for nightmares. It’s free to enter, so it’s worth going if you like being utterly baffled. 13. The toilets – It might sound a little bit strange to recommend a city based on its toilets, but Singaporeans seriously know how to do their business in style. Beautifully designed and clean enough to eat from, it’s amazing that we didn’t have to pay once to use a lavvy in this city. 14. The Cat Cafes – Need we say more? There are 5 cat cafe’s in Singapore. We like The Company of Cats on Mosque Street, which serves tasty snacks and drinks to enjoy with their 10 adorable rescue cats. 15. It’s the world’s first Smart Nation – The Singapore Government has implemented an undisclosed number of sensors and cameras around the city to track it’s citizens and collect data. This all sounds a bit Orwellian, but it’s difficult to argue against a system that makes a city run so smoothly. Singapore is a beautiful, diverse, culturally rich nation full of happy people, clean streets and incredible food. If you’ve never been, or you are thinking of going again, we urge you to book your tickets right now! See you at Changi! We could not stop eating in Singapore. For Nick, who thinks about what to have for dinner whilst eating breakfast, Singapore was a dangerous place. There was so much food on offer that we had to plan our days around meal times to make sure we didn’t miss a chance to visit one of the many hawker centres. Sure, there are shiny sights to see, tranquil temples to refresh your spiritual side and hyper-commercialised malls to lose all sense of self in, but what it came down to for us was the food. The obscenely delicious and bewildering cheap street food. You might want to have some snacks at the ready now because reading any further will make you hungry – a bit like how watching Bake Off makes you crave cake. We arrived in Singapore at 5am after a 9 hour flight from Fiji. Needless to say, we were tired. Our priority was for coffee. Very strong coffee. We set out around Chinatown naively hoping to find a hipster cafe serving flat whites and espressos, but it quickly became apparent that we weren’t in that kind of gentrified neighbourhood. We started to worry that we wouldn’t find any coffee here and we’d be stuck with the sachets of instant from the hostel kitchen (the horror, oh the horror). But then we hit Chinatown Complex, a no-holds barred, multi-storey market. On the first floor, we found row after row of hawker stalls. Amongst them we found one that claimed to sell coffee, but there was no espresso machine in sight. Fearing we’d be served up Nescafe or worse, we ordered anyway – 1 black and 1 white coffee. It took us a while to explain we didn’t want any sugar – it seems everyone takes heaps of sugar here – but then we watched with great smiles on our faces as treacle thick coffee poured from a giant conical jug into 2 ceramic mugs, one of which had been prepared with condensed milk. These were topped up with hot water and we were given our first dose of kopi – coffee Singapore style. It was incredible. The smoothest coffee we’ve ever had, with deep rich roasted favours and just the right balance of bitterness. Flic, dubious of the condensed milk situation, was bowled over by the caramel sweetness. We ordered kopi with condensed milk every day since – the cheapest kopi can be found in the superb Chinatown People’s Park Complex – 1.60sgd for two cups! – and we found ourselves purposely avoiding places with espresso machines. Crazy. We could go on for hours about the cut price Tiger beer served in heavy duty glasses with ice or the fresh juice stalls that will juice up pretty much anything you can think of (try soursop and kiwi fruit and you will not be disappointed), but we won’t because we’re here to talk food. As a couple it’s healthy to hold different opinions, and for us this was the case with our favourite dish in Singapore. Nick was truly taken by the Mala Hot Pot stall which can be found in the already mentioned Chinatown People’s Park Complex. After trying to explain that we’d never tried hot pot and we didn’t know how it worked, the delightful old dear running front of house simply piled a large tray with an assortment of uncooked greens, phallic looking mushrooms, meats and, in spite of our protestations, thick slices of potato. With no idea what would happen next, we handed over 14sgd (about 8 quid) and were told to wait. After a few minutes, we were given a massive bowl of utterly delicious stew, containing everything that had been crammed onto the tray beforehand. It had all been stir-fried perfectly and combined with a red hot steaming broth. Not only was the stew bursting with chilli heat and tidal waves of omami, it was packed with Szechuan peppercorns. These little blighters caused a slight tingle on the tongue and the lips which quickly became all out narcotic numbness, somehow amplifying the chilli heat. Nick drank so much of the broth that he went into a sweaty face-melting chilli trance. Great fun for him. Not so pleasant for everyone else. Flic’s favourite dish can be found in the always crowded Amoy Street Food Centre, tucked away behind the charming and shady Ann Siang Hill Park. The famous A Noodle Story stall claims to sell the only Singapore ramen in Singapore. A bold claim perhaps, but they’re clearly on to something because the lunchtime queue was about 30 minutes long and the two young chaps running the stall have been awarded a Michelin Bib Gourmand, which is a kind of runner up prize to a Michelin star. What we were served, after waiting in line in the stifling humidity of the food court, was just about worth the wait. The two hawker upstarts have clearly learnt their trade in some fancy kitchens because the bowl was a work of art to behold. With it’s carefully sprinkled garnish and perfectly arranged components, we had to check we were still in a food court – the 5.80sgd price tag was a good reminder. What did it taste like? An oh-so-porky Singapore-spicy broth held together just beyond al dente wanton mee (noodles) with a Japanese style braised egg and slow cooked, super tender belly pork. This was accompanied by a prawn wrapped in spiralled potato which had been deep fried. What this addition had to do with Singapore is a little beyond us, as we didn’t see this carb-crustacean combo offered anywhere else. Still, it was pretty tasty and added some crunch to the dish. Altogether this was an impressive, if slightly pretentious, addition to the already vibrant Singapore food scene. The locals may grumble about the unnecessarily long queue and a loss of traditional cooking values (and they do have a point here) but if this finesse and fusion is the start of a new movement in Singapore street food, we look forward to tasting more of it soon!